We had reported earlier that team Anjaan has been shooting in different locations in Mumbai and other places in Maharashtra. Well, the latest update we hear is that the team is now camped in Panchgani, the beautiful village near Pune, to shoot a song. It should be noted that a few portions of the 'Ballelakka' song from Sivaji were also shot in this village. 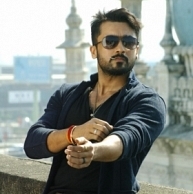 Anjaan is directed by Lingusamy and has Suriya in the lead. Yuvan Shankar Raja has composed the music for the film and the camera is being helmed by Padmashri Santosh Sivan. Kamal's camp confirm Drishyam remake! Vishal tight lipped about Iniya ! People looking for online information on Anjaan, Lingusamy, Suriya will find this news story useful.